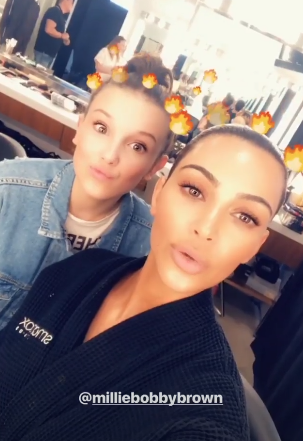 Millie Bobby Brown’s dream of meeting a Kardashian has finally come true — and there’s video to prove it. 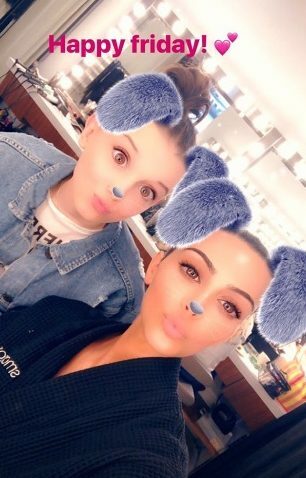 Both the Stranger Things actress and Kim Kardashian West excitedly told their followers on Instagram Story about their hangout on Friday, March 30th, which had probably been in the works ever since Brown adorably confessed her love for Keeping Up With the Kardashians on The Tonight Show back in October. "Keeping Up With the Kardashians all the way. I love them," Millie Bobby Brown said, when host Jimmy Fallon asked about her TV likes. "I'm obsessed with them. I follow them on social media. I think that they are just like really great. They're so entertaining. They have their own, like, language. Like instead of saying 'I swear,' they're like 'Bible!' And then they're like, 'Okurrr!' It means like OK. It's like, 'Okurrr!'" Millie Bobby Brown’s Instagram Story shows the pair using a bunny-ear filter in honor of Easter weekend. We’re pretty jealous of Kardashian West, to be honest, as we’re *HUGE* fans of Stranger Things and Eleven in particular. Though we don’t know where this mutual adoration will take them, we do know we’re absolutely here for it. Anyone else hoping Eleven makes a quick stop over at KUWTK? Hey, stranger things have happened.